THOMAS PAINE. Autograph Poem Signed “T.P.,” to Mrs. Barlow. [c. 1798-1799]. 2 pp., 7¼ x 9⅜ in. To Mrs. Barlow, on her pleasantly telling the author that after writing against the superstition of the Scripture religion, he was setting up a Religion capable of more bigotry and enthusiasms, and more dangerous to its Votaries, that of making a religion of Love. Is half the World to me. —This prayer is Common Sense. Is happiness of Mind. T.P. 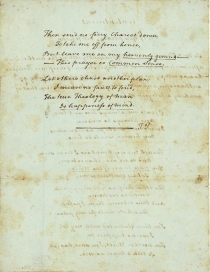 Though overshadowed by his more justly famous prose works including Common Sense, The Rights of Man, The Age of Reason, and others, Paine wrote a fair amount of poetry, including verses addressed to Lord Howe, on the death of General Wolfe, and an ode to the patriots of Boston. 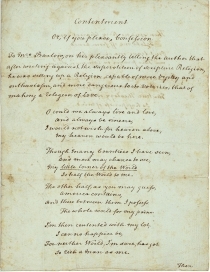 Philip Foner’s collection of Paine’s writings published fifteen poems, including the present manuscript, then owned by the Thomas Paine National Historical Association, which has since deaccessioned it. Such a poem as this, however, on questions of love and happiness, is quite uncommon in Paine’s canon. 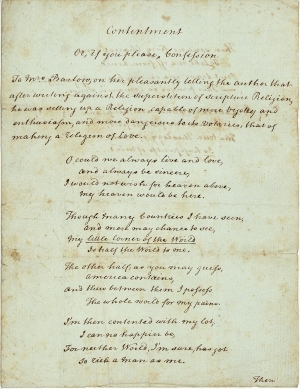 Any manuscript material from Thomas Paine is rare; poetry that incorporates themes from Common Sense is very desirable indeed. Joel Barlow (1754-1812) was one of the “Hartford Wits,” a group of young writers and poets that included Lemuel Hopkins and John Trumbull. An aspiring epic poet, Barlow’s most famous work, Hasty Pudding, was written in the mock heroic style. He was a career diplomat who negotiated the 1796 Treaty of Tripoli, which ended raids on American shipping by the Barbary pirates. The treaty contained the phrase “the Government of the United States of America is not, in any sense, founded on the Christian religion” likely in an effort to convince North African Muslims that the United States was different from the European nations who had launched the Crusades and that the treaty was between two secular states, not two religious powers. Philip S. Foner, ed., The Complete Writings of Thomas Paine, Vol. II (New York: Citadel, 1969), 1467-68.